Decida turka venko; Traktato de Laŭzano. La Milito por Turka Sendependiĝo (turke: İstiklâl Harbi aŭ Kurtuluş Savaşı, laŭlitere Milito de Libereco); estis milito okazinta inter la 19-a de majo 1919 kaj la 24-a de julio 1923. Ĝi estis milito enkondukita de la turkaj naciistoj kontraŭ la Aliancanoj — nome Grekio ĉe la okcidenta fronto, Armenio orienta, Francio sur la Sudo kaj kun ili, Unuiĝinta Reĝlando kaj Italio en Konstantinopolo (nun Istanbulo) —, post kiam la lando estis dividita fare de la Aliancanoj sekvante la malvenkon de la Otomana Imperio dum la Unua Mondmilito. Malmultaj de la okupantaj britaj, francaj kaj italaj trupoj estis deplojitaj aŭ engaĝitaj en batalo. La Turka Nacia Movado en Anatolio kulminis per la formado de nova Granda Nacia Asembleo de Turkio kiu sukcese mobilizis ĝiajn rimedojn sub gvidado de Mustafa Kemal. 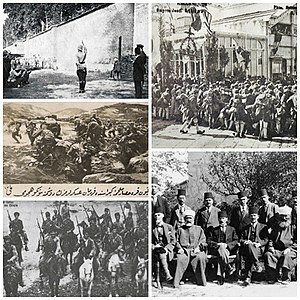 Post la kampanjoj kontraŭ ofensivoj de Grekio, kaj de la Turk-armena kaj Franca-turka Milito, la turkaj revoluciuloj devigis la aliancanojn prirezigni la Traktaton de Sèvres kaj negoci la Traktaton de Lausanne en julio 1923, forlasante Anatolion kaj Trakion por formi la Respublikon Turkio en oktobro 1923. La establado de la Turka Nacia Movado kondukis al la fino de la Otomana epoko kaj kun la reformoj de Atatürk estis kreita moderna, laika nacio-ŝtato. ↑ JELAVICH, Barbara. (1983) History of the Balkans: Twentieth century. Cambridge University Press. ISBN 978-0-521-27459-3. ↑ The Place of the Turkish Independence War in the American Press (1918-1923), Bülent Bilmez: "...the occupation of western Turkey by the Greek armies under the control of the Allied Powers, the discord among them was evident and publicly known. As the Italians were against this occupation from the beginning, and started "secretly" helping the Kemalists, this conflict among the Allied Powers, and the Italian support for the Kemalists were reported regularly by the American press." ↑ Turkey, Mustafa Kemal and the Turkish War of Independence, 1919–23. Encyclopædia Britannica (2007). Alirita 2007-10-29. ↑ Turkish War of Independence. Microsoft Encarta Online Encyclopedia 2007 (2007). Alirita 2007-10-29. ↑ Turkey, Section: Occupation and War of Independence. History.com Encyclopedia (2007). Arkivita el la originalo je 2007-10-24. Alirita 2007-10-29. Ĉi tiu paĝo estis lastafoje redaktita je 19:55, 24 jul. 2018.